Housed in the former Bankside Power Station, which has been transformed by Swiss Architects Herzog & de Meuron into a spectacular new modern building, the Tate Modern is Britain's greatest museum of modern art. It showcases an exhaustive collection, featuring works from 1900 to the present day, including works by Dalí, Picasso, Matisse, Rothko and Warhol, as well as temporary exhibitions by contemporary artists. There is also an exceptional roof café, which affords spectacular views over London, and an impressive gift shop. 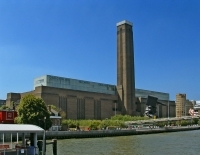 A must-see attraction for visitors to London, you will be sorely remiss to pass up a visit to the Tate Modern. Opening times: Open Sunday to Thursday 10am to 6pm; Friday and Saturday 10am to 10pm. Last admission is 45 minutes before the closing time.